In Morocco, sugar is traditionally sold in 2kg cones. I often see cart loads of blue and white wrapped cones being distributed from a depot in the Mellah area of Marrakech. In rural markets, people cannot always afford the whole cone and so pieces are broken off and sold by weight. In the stunning Nejjarine woodworking museum in Fes, one can see antique wooden sugar moulds and beautifully decorated wooden hammers used for breaking the sugar into pieces. On a recent visit to a Berber home in the High Atlas mountains just outside Marrakech, I asked our hostess what she used to break down her sugar cones. She produced a section of flat iron and told me she had been using it for over 20 years. It certainly works! As an essential ingredient in Morocco’s famous mint tea, sugar is often presented in a decorative silver box forming part of the classic tea service – brazier, teapot, tray, container for green tea, container for sugar, container for mint and tea glasses… more about that in a coming post! I am a cooking teacher, tour leader, cookbook author and passionate photographer. Find out more by visiting my website www.meerafreeman.com.au. Meera’s devotional commitment to sharing the names of Melbourne’s finest purveyors – from Lygon Street to Brunswick Street and Victoria Street – is deserved of a medal. She celebrates ingredients and honours the task. Thanks Meera. Meera’s Autumnal Italian class is a case in point. Could the anchovy and humble durum wheat pasta become more divine? Oh, thank you John. It is such a pleasure sharing knowledge about fine produce that just brings tears to your eyes! engaged in any export activity that I can see. 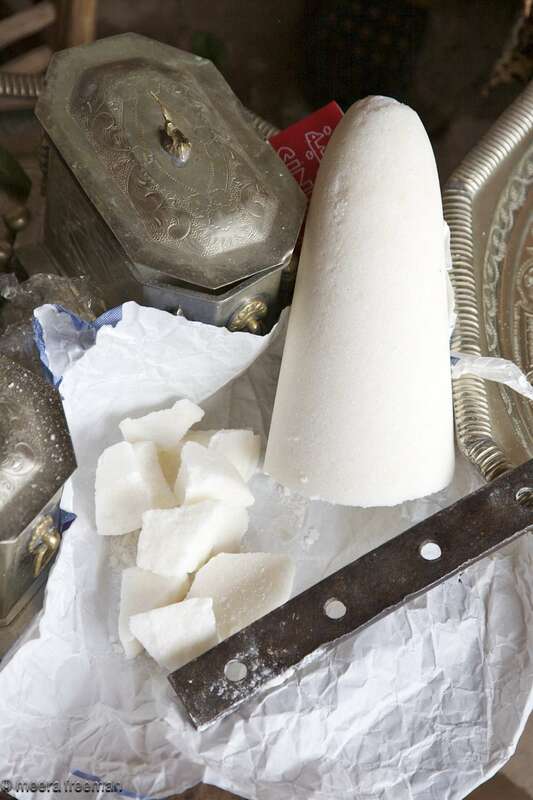 I know this was old…but Moroccan sugar cones are sugar just like regular white sugar cubes. They are very cheap here, so I’m not aware of people who can’t afford them. They are commonly brought to condolences after a death. The mourning family collects them all, sells them back to the markets, and uses the proceeds for a meal for all the people who had come to offer condolences.